Palmerston NOrth on a Budget. When it comes to travelling on a budget, there couldn’t be a better city than Palmerston North. With free parks, gardens, walkways, museums and markets in the city centre alone, you don’t even have to spend a dime to enjoy this city in the Manawatu-Whanganui region. And that’s not even including the awesome free and cheap things to do just outside of the city! All of the attractions mentioned on this list just happen to be the main attractions of the city, so you’re not missing out on much if you just do the free or cheap things to do in Palmerston North! To save money further, consider staying in one of the 5 Best Backpacker Hostels in Palmerston North. 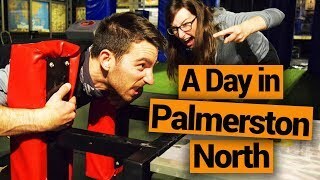 Plus, check out some more things to do in Palmerston North in our Palmerston North – Guide for Backpackers. Palmerston North is an amazing base for both scenic bike rides and mountain biking. The Manawatu Pathway is the easiest (and cheapest as you only need to rent for half a day) cycle trail to access from the city centre and is suitable for almost everyone! Ride or walk alongside the Manawatu River, passing gardens, great picnic spots and more! For more rides in the area, including mountain bike parks, see our guide to Mountain Biking in Palmerston North. Location: There are several access points to the Manawatu Riverside Pathway, the most accessible being Riverside Drive, Ruahine Street, Albert Street, Centennial Drive, The Victoria Esplanade, Dittmer Drive and Maxwells Line. Te Manawa Museum is the Art, Science and History Museum of Palmerston North. Learn about the local history, both Maori and European, and see some fascinating artefacts on display! Interact with science displays and check out the latest art exhibitions. The museum is free, so what do you have to lose?! This central park in Palmerston North is packed with sculptures, duck ponds and walkways! It’s a great place to hang out and people watch. A highlight is the huge clock tower right in the middle of The Square. Location: The Square (city centre). If there’s one thing that New Zealand cities do well, it’s street art! As well as all the sculptures you can find around Palmerston North city centre, the street at down Berrymans Lane is another highlight! Palmerston North has a hell-of-a-lotta great places to eat! George Street in particular is the go-to for locals looking for a great coffee or a bite to eat, at establishments such as Urban Pantry, Cyclista, Arrosta Coffee and more! What’s more, having a culinary experience can be pretty affordable… Only if you can resist trying everything! Location: Palmerston North city centre. Palmerston North isn’t just about the urban activities, but it also has some nature experiences that will make it hard to believe that you’re still in the middle of the city! One of those places is Bledisloe Park. Walk among native trees in an area that mimics what the whole of the area would have been like before the city was developed. For more walks within driving distance of Palmerston North, see 26 Awesome Hikes Around Palmerston North. Palmerston North is surrounded by awesome attractions and day trips. One of the best day trips is Manawatu Gorge. 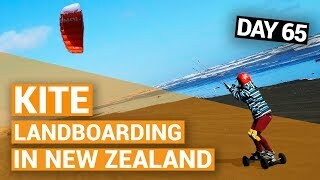 Stop by the town of Ashhurst, check out these things to do in the town, then head up to the Te Apiti Windfarm Lookout! 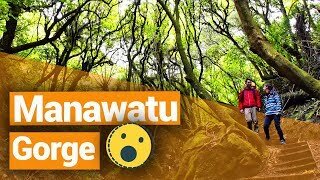 Next, do some bush walks in the Manawatu Gorge. Location: Ashhurst is 15km northeast of Palmerston North. Te Apiti Windfarm is up Saddle Road. Manawatu Gorge is along State Highway 3. If you hadn’t noticed, New Zealand is kinda crazy about rugby! Learn about the history of this national sport at The New Zealand Rugby Museum! Check out some of the rugby memorabilia and even try some of the interactive challenges in the centre of the museum. It’s a must for any rugby fan! At only around NZ$12 entry for an adult, it definitely counts as a cheap thing to do in Palmerston North. For a great atmosphere, entertainment and to pick up something special, check out one of the weekly and monthly Palmerston North markets. Our top picks include the Saturday Feilding Farmers’ Market which is the most popular in the region. There’s also the monthly Village Night Market set inside the city library. Location: Feilding is about 19km north of Palmerston on State Highway 53. The Palmerston North City Library is on Rangitikei Street. Another amazing park in the heart of Palmerston North is Victoria Esplanade. Wander among the rows and rows of rose gardens, walk among the native bush and exotic arbotetum, check out the native duck aviary, and take the kids on the miniature scenic railway. Location: Park Road or Manawaroa Street. 11. Go to the beach! Just about 30-minutes drive from Palmerston North are a number of long-stretching beaches, perfect for all your typical beach activities and more! Himatangi Beach is renowned for its gorgeous sunsets. Foxton Beach is a great place for long walks, as well as all these extra things to do in Foxton town. Location: Himatangi Beach is about 36km west of Palmerston North down State Highway 56. Foxton Beach is about 44km from Palmerston North, just south of Himatangi Beach. This oxbow lake right in the city is a great place to relax with a picnic or feed the ducks. There are also some walkways around the area to enjoy. A rainy day activity and an affordable thing to do in Palmerston North, VertX is an indoor climbing hall with 21 different rope climbs. Challenge yourself with a range of difficulties or try something different like bouldering or slack lining. Location: 148 Park Road, West End. For a great day out, drive up the Pohangina Valley with excellent views of the Ruahine Ranges and rural New Zealand! There are awesome bush walks in the Totara Reserve, free campsites, mountain biking trails, mountain hikes, gardens and even wine and cheese tasting. Check out all your options in our 14 Best Things to Do in the Pohangina Valley. Location: The Pohangine Valley starts just north of Ashhurst. No, not some random lady living in Palmerston North, but a nearby town called “Shannon”. The quaint little town just south of Palmerston North is a great city escape with boutique stores and access to hikes in the Tararua Forest Park. There’s even a native bird sanctuary to check out. Find out more in our list of 5 Fun Things to Do in Shannon. Location: 31km south of Palmerston North. Take State Highway 56 then State Highway 57 south.